Shepard One of 200 copies in the large paper issue signed by both author & illustrator. [xiv], 159, [3, blank] pp. Publisher's pink paper over boards with blue cloth spine, pink paper spine label. First American edition, limited issue. One of 200 numbered copies in the large paper issue printed on Japanese vellum, signed by both A. Shepard on limitation leaf at front. Near Fine with light wear and slightly free hinges, tiny closed tear in top of p. In Very Good slightly edge-chipped dust jacket with a bit of soiling to back panel, slight rubbing. A deluxe signed edition of the beloved children's book. 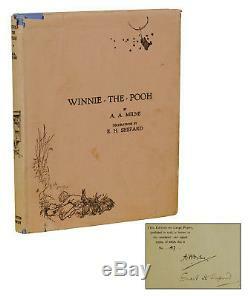 The item "Winnie the Pooh by A. MILNE SIGNED Limited First Edition 1926 1st Shepard" is in sale since Friday, March 23, 2018. This item is in the category "Books\Antiquarian & Collectible". The seller is "burnsiderarebooks" and is located in Portland, Oregon.